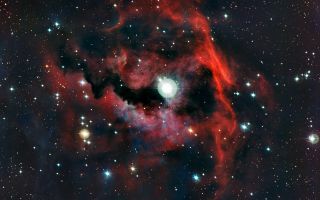 This image from ESO’s La Silla Observatory shows part of a stellar nursery nicknamed the Seagull Nebula. This space wallpaper from ESO’s La Silla Observatory shows part of a stellar nursery nicknamed the Seagull Nebula. This cloud of gas, known as Sh 2-292, RCW 2 and Gum 1, seems to form the head of the seagull and glows brightly due to the energetic radiation from a very hot young star lurking at its heart. The detailed view was produced by the Wide Field Imager on the MPG/ESO 2.2-metre telescope. Image released Sept. 26, 2012.